1. It's made from a secret recipe and the butchers will not tell you what it is. 2. It's pitch black because of the air drying and the marinade. It's so weird-looking that my husband has dubbed it "baby seal." Henyway, the steak is best done up on the grill. Because it's so black it's hard to know where the marinade ends and the yummy, smokey,crusty char begins. The butchers will give you exact directions on how to cook it. I follow it to the "T" and have never been disappointed. The one time I overcooked it, it was still yummy, but I missed the juicy red center. I prefer it cooked medium, but anyway you slice it, it's going to be a winner. It's also a fun thing to bring to cook-outs since people that have never seen it before just stare at it wondering what it is. If you ever find yourself at Stanford Shopping Center in Palo Alto, swing around the backside and visit Schab's. It's worth a visit even if you don't buy a thing. [hanging head woefully] yes, it's true. there is no good chinese in this town. mexican i can take or leave, but i have to get to SF to get some good chinese soon or i might die. did you ever make it to pok pok/whiskey soda lounge when you were here. great thai, more authentic than most. if not, be sure to go next time you're in town. I used to work at Schaubs. 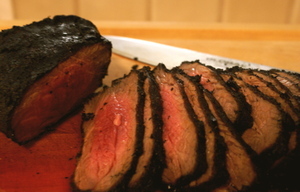 The best was when we cooked up a bunch of Fred's steak for the deli and then sliced it up. We were able to set the "heel" of the steak aside for snacking on our break. Yum. Even though I worked at the store, I never knew the secret of the steak. Only Dave's family and those who married in know the secret of how to turn the steak black. Yum. Excuse me, gotta make the drive to the mall and pick up a steak and some chicken sausages. In my town there is only Chinese.I've never tried Mexican.Is it really good for eating? I tried a version of this marinade I found on the net for my July 4th cookout and it was great. I would love to try the real thing to see how close I got!